Lose Weight Walking With "Walk Away The Pounds"
It's possible to lose weight walking in the privacy of your own home or outdoors. I know because I've done it. The "Walk Away The Pounds" workout routines are in-home walking workout "systems", available on DVD. The program claims to help you get in shape and lose weight walking in the comfort of your own home. Basic moves within the walking workout routines are designed to take you from warm up to cool dow/stretch. During the routine, participants are introduced to some basic weight training called "Walk Away Weights". The round weighted balls are incorporated during the routine to increase fat-burning potential and tone muscle during the walk. All to ensure you lose weight walking and maximize your workouts for higher calorie burn. The program has different levels beginner, intermediate, and more advanced workouts. Lesie Sansone demonstrates each move prior to participant actually doing them. There are also modified moves, done by one of the young ladies in the front row. Randy, the only male participant in the group does the workouts without weights. I never purchased the weighted balls, but used my own 2 pound dumbbells. In my personal opinion, the program does what it claims to do. I've used Walk Away The Pounds for several years and have had good results. When I first started using it, I did not weigt loss (about 5-10 pounds). However, walking with Leslie alone, isn't enough to see major weight loss results (for me), but it is good for beginner workouts, shedding a few pounds, and getting your body in shape for next level workouts. Some days I use Walk Away The Pounds to supplement my weight training workouts. I might do the weight training in the morning and Walk Away The Pounds in the evening. Also, on days when I'm lazy and don't want to work out, I'll pop in the Walk Away The Pounds 3 mile walk (45 minutes). If you're a person who loves to be outdoors, you wont get that by walking in your living room with the girls and Randy. Conversley, when the weather is bad or you missed a workout, you can just pop in a dvd and still get in a good workout. Also, the product is not very expensive. 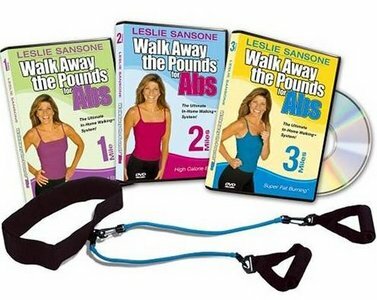 I got the Walk Away the Pounds Delixe 2 Pack DVD Edition for about $15 at Amazon. I think it is definitely worth the price because I use it a lot. There are some other editions like, Walk Your Belly Flat, Walk Away The Pounds Power Mile, and 5 Day Slim Down: A Mile Each Morning; and one I might try called "Walk Off More Weight". Yes you can lose weight walking with Leslie Sanson in her Walk Away The Pounds videos. And you will get a good all over body workout routines, but eventually, you will need to supplement with additonal muscle toning workout routines if you want to achieve a more muscular physique. Keeping in mind I haven't used any of her latest products that claim to "burn more fat" and help you "lose more weight" walking.